A file with the HFS file extension is an HFS Disk Image file. HFS stands for hierarchical file system and is the file system used on a Mac computer for describing how files and folders are to be structured. An HFS file, then, organizes data in the same way, except that all the files are contained in a single file with the .HFS file extension. They're sometimes seen stored inside DMG files. HFS files are similar to other disk image files in that they're used to store and organize lots of data in one manageable file that can easily be transferred around and opened at will. HFS is also the abbreviation for a free web server called HTTP File Server but HFS files don't necessarily have anything at all to do with that server software. You can open HFS files on a Windows computer with any popular compression/decompression program. Two of our favorites are 7-Zip and PeaZip, both of which are able to decompress (extract) the contents of an HFS file. HFSExplorer is another way you can open an HFS file on Windows. This program even lets Windows users read Mac-formatted hard drives that are using the HFS file system. Mac OS X 10.6.0 and newer can natively read HFS files but can not write to them. One way around this limitation is to use a program like FuseHFS. If you rename the .HFS file on a Mac to .DMG, the OS should immediately mount the file as a virtual disk when you open it. While it's unlikely with HFS files on your computer, it's possible that more than one program you have installed supports the format but the one set as the default program isn't the one you'd like to use. 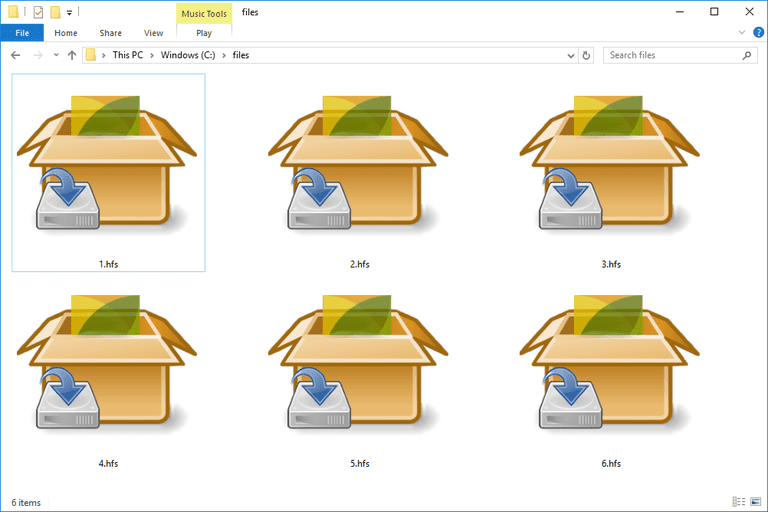 If so, see how to change file associations in Windows for instructions on changing the program. Lots of file formats can be converted using a free file converter, but we don't know of any that are able to save an HFS Disk Image file to any other format. One thing you could do, however, is "convert" the files manually. By this, we mean you can extract the contents of the HFS file using a file unzip tool mentioned above. Once all the files are stored in a folder, you can then repackage them in another archive format like ISO, ZIP, or 7Z using one of the compression programs above. If you're not trying to convert the HFS file, but instead the file system HFS, to another file system like NTFS, you may have luck with a program like Paragon NTFS-HFS Converter.